VATICAN — Vatican television took the liturgical world by storm last Friday by giving Catholics their very first official look at a short teaser trailer from the upcoming papal Christmas Mass. Focusing much of the trailer on new cantors and deacons that will play a role in the Mass, the 88-second Christmas Mass teaser had many excited about Christmas. 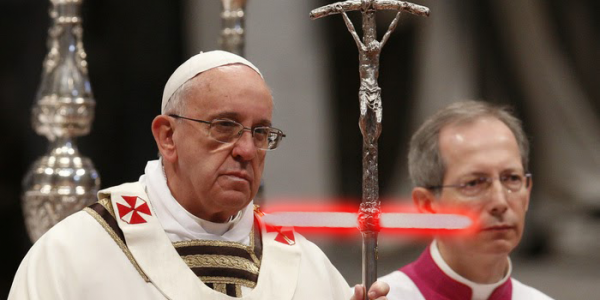 But along with those feelings of Christmas ecstasy came some controversy with liturgical purists about the Pope’s unique new crossgaurd lightsaber crosier, which has consequently polarized many die-hard fans of the Mass. Many of the complaints and cynicism stem from the belief that the new crosier is just a cheap Vatican “it looks cool” thought process and that having these side-angled blades would just put the Pope at risk of cutting himself during the entrance procession. Many say that the “Crosier 2.0” has a major flaw in the design, saying that the light emitter sticks out inches before the laser quillion begins on each side of the crosier, meaning that the little emitters could simply be severed off if it came in contact with another crossguard lightsaber crosier, and if that crosier were to slide down the main shaft. The Vatican has come out in defense of the new crosier, with an inside source saying that there is no chance of severing off the side emitters because a Mass typically does not have more than one person carrying a crosier. He also went on to explain why the crosier’s cross guard works.